An EU carbon trading scheme is set to add £130 [by perhaps 2020!] to the cost of a family holiday to the United States, a new study has found. Research by the Civitas [http://www.powerbase.info/index.php/Civitas – London based right-wing think-tank] , an independent think tank, predicted that the Brussels-backed green levy will not only hit air passengers, but also inflict serious damage on Heathrow Airport, putting large numbers of jobs at risk. A family of four taking a transatlantic flight from Britain already have to pay £260 in Air Passenger Duty. This is due to increase in line with inflation each year. [The Treasury have confirmed that APD is NOT an environmental tax, and is charged to compensate for the fact that aviation pays no fuel duty and no VAT. Page 10 of Reform of Air Passenger Duty ]. The introduction of the EU Emissions Trading Scheme in which airlines will have to pay for permits if they exceed their allowance will heap even more expense onto the cost of travel. [Airlines are getting 85% of the permits they need in the first year free]. According to the EU’s own estimates the scheme, which began at the start of the year, will add about £10 to the price of a transatlantic ticket. But unlike APD it will apply to inbound and outbound flights. [i.e. £20 per person]. This would, even by the EU’s own figures add another £80 to the price of a family holiday for 4 people. However Citivas believes that the cost will continue to rise over the decade, predicting that by 2020 a family of four could find that it will be paying an additional £130 [ based on what estimate for the cost of a tonne of carbon?/] for return transatlantic flights to cover the cost of the carbon permits. Overall, the report says, the carbon trading schemes will cost airlines £1 billion a year, with the expense likely to be passed on to passengers. David Merlin-Jones, the author of the Civitas study, has also questioned the green credentials of the carbon trading scheme. He also warned that ETS would give airports outside the EU, such as Geneva, a competitive advantage. Ultimately, the report warns, Heathrow could lose its status as a major international hub, which would put jobs at risk. With Britain accounting for nearly a quarter of all aviation in the EU, the UK economy would be particularly badly hit. Just before Christmas a coalition of American airlines unsuccessfully challenged the scheme in the European Court of Justice. The court ruling in favour of the scheme has triggered fears that the USA and other countries outside the EU could retaliate in protest at their airlines being forced to pay the levy. Although the impact on aviation has been the most controversial aspect of the trading scheme, the Civitas report argues that the EU’s flagship environmental scheme is also hitting other parts of the household budget. Fuel bills will also rise as a result of the EU setting a minimum price for carbon. This, the report says, will push another 110,000 British families into fuel poverty by 2016. Overall the scheme will see each EU citizen subsidising the power industry by £30 a year, according to the Civitas calculations. In an interview on Radio 4 Today programme a spokesperson from easyJet said fares were likely to rise by an “insignificant” amount, of 30 – 50p per ticket. Lufthansa has told passengers to brace for higher ticket prices as it refuses to shoulder the costs of the EU’s Emissions Trading Scheme which now applies to airlines. The world’s second largest long-haul carrier after Dubai’s Emirates said it faced EUR€130 million (USD$169 million) in extra costs this year and became the first major operator to announce possible surcharges since the EU scheme took effect on January 1. The increases will not go into effect straightaway. Under plans to tackle climate change, airlines touching down or taking off in the 27-nation European Union and three other nations must account for their CO2 emissions as part of an expansion of the world’s largest carbon market. The United States, China, India and others have attacked the scheme on the grounds that it infringes their sovereignty and that the EU should not act alone. Some have warned of counter-measures, firing talk of the world’s first carbon trade war. The EU says its Emissions Trading Scheme, which already applies to other industries, is the fairest way to cope with aviation’s contribution to global warming and cuts through years of inconclusive efforts to come up with a worldwide alternative. Analysts say Lufthansa is among the airlines most affected by the scheme, along with other European network rivals such as IAG and Air France-KLM, and United Continental and Singapore Airlines. Germany’s biggest airline said it would add the costs from the ETS to its existing fuel surcharge, becoming the first carrier to provide details of how it plans to cope with the additional burden. “In the face of intensive competition, especially of companies from non-EU countries whose production is subject to emissions trading to only a small degree, Lufthansa will have to pass on the burden via ticket prices, as suggested by the EU,” it said in a statement, adding this would not happen in the short term. Fuel cost surcharges: Lufthansa last raised its existing surcharges last month — to between EUR€102 and EUR€122 per flight leg for intercontinental flights and to EUR€31 for domestic and European flights. It said this was purely to cover higher fuel costs. [Compare this to the extra £10 or so for the ETS]. The industry has until now been reluctant to talk about higher prices, saying it would be too difficult to pass on the higher charges because of shaky demand and Europe’s debt crisis. Critics say airlines are using the emissions row as a smokescreen to hit the consumer. “If you look at the impact on the ETS, that only starts kicking in at the end of the year. It’s very clear that they’re (airlines) looking for excuses in more or less the same way as the power companies did when the ETS started,” said Dutch Green member of the European Parliament Bas Eickhout. Airlines say they can ill afford the burden on top of high fuel prices, fierce competition and national taxes. The airline industry expects the scheme to cost it about EUR€1 billion this year, rising to EUR€2.8 billion by 2020. However, the crunch point will not come until March 2013 when airlines will be asked to surrender enough permits to cover this year’s carbon emissions or else face stiff penalties. In practice, industry experts say it will be difficult to gauge the overall impact of the scheme, which depends on the competitive conditions on each route. “Fares are dynamic. They are going up and down all the time according to market conditions. Carbon is just another cost,” said Bill Hemmings, manager of environmental lobby group Transport & Environment. To get the scheme up and running, airlines will collectively receive in 2012 free permits amounting to 85 percent of their estimated needs. But the industry says these have been under-estimated because travel has increased since they were calculated on the basis of 2004-2006 data and is set to grow further. [That is the whole point of the scheme – to cut the growth in emissions. If an airline grows, it has to buy permits. That is what the ETS does ….no surprise there]. Lufthansa said it would need to buy 35 percent of the permits it needs for 2012 on the open carbon market. 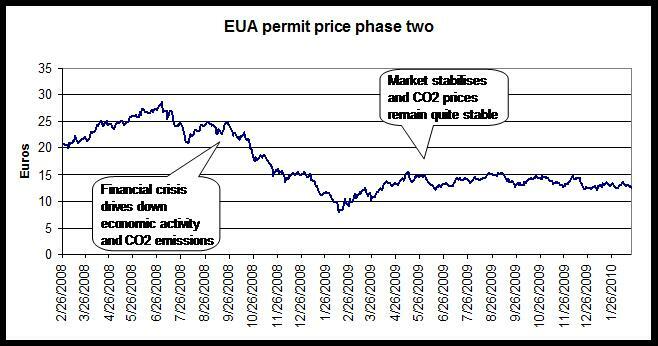 Permits have roughly halved in value in the past year to 7.9 euros per ton of carbon amid fears of recession. The scheme went ahead after Europe’s highest court threw out a challenge last month. But the US Congress is considering measures that would forbid US carriers from taking part. Analysts say many airlines may jump in to cover future needs before many of their non-EU rivals, discouraged by their governments from taking part, enter the fray. Date? Nov or Dec 2011? Airlines are facing a bill of up to EUR1 billion to implement the E.U.’s Emissions Trading Scheme when they are included in the European carbon market in January, and they are planning to absorb much of the extra costs initially in an effort to prevent exacerbating a renewed downturn in the sector. From next year, any airline flying into or out of the E.U. will be required to hold permits that allow them to emit one ton of CO2 for every flight landing and taking off in the European Union. In an effort to help an industry united in its opposition to the emissions scheme, the European Commission this week said it will give airlines permits to cover 85% of their CO2 emissions in 2012 for free. Between 2013 and 2020, airlines will get 82% of the permits for free, with 15% auctioned to meet additional needs and 3% set aside for new entrants to the scheme. However, Standard & Poor’s estimates that this will still mean airlines have to pay about EUR975 million to fund the rest of their trading scheme needs next year alone, assuming a carbon price of EUR13 per ton of carbon dioxide. The figures are backed by Europe’s major airlines. Deutsche Lufthansa AG (LHA.XE) said it expects to have to buy permits to cover about 30-40% of its ETS needs, at a cost of between EUR150 million and EUR350 million. Europe’s largest budget carrier, Ryanair Holdings PLC (RYA.DB), has forecast its bill will top EUR15 million to EUR20 million in 2012, while easyJet PLC (EZJ.LN) said it estimates costs to be GBP25 million between January and September alone. British Airways, part of International Consolidated Airlines Group S.A. (IAG.LN), and Virgin Atlantic declined to give estimates, although Virgin said it would be a “significant cost” to the business. The E.U.’s rationale for its carbon scheme is to try and combat climate change by capping CO2 emissions. It is bringing airlines into the scheme because although the industry is only responsible for between 2% and 3% of global emissions, that proportion is expected to grow rapidly in coming years as air travel becomes more accessible. However, the scheme is coming at a bad time for airlines, which already face high fuel bills and taxes and the latest signs of a renewed downturn in travel demand amid the sovereign debt crisis and weak consumer and business sentiment. Given that background, airlines will be hard pressed to push the extra costs on to travellers. The European Commission has calculated that the Emissions Trading Scheme will push prices up between EUR2 and EUR12 a ticket, but until that can be passed on airlines face an added burden in the first year. A spokesman for easyJet said the airline would absorb the increased cost initially as it usually takes 18 months to pass on the costs in full without forcing customers onto rival airlines. Virgin Atlantic echoed those comments. The scheme applies to all airlines operating into and out of the E.U., but a group of U.S. airlines is arguing in the European Courts of Justice that it shouldn’t apply to non-E.U. airlines. United Continental Holdings Inc.’s (UAL) President and Chief Executive Officer Jeff Smisek said earlier this month that the airline “has no choice but to comply” and that it is already doing so with data collection processes. However he added: “We are obviously suing and we hope we win.” [They lost – decision on 20th December 2011] “(The) fact is that today China, India, the USA and even medium-sized countries such as Algeria are expressing strong opposition and heavy complaints against EU-ETS,” a Lufthansa spokesman said. He said it was important that there is a global aviation solution to climate change, otherwise competition distortion would arise. The European Parliament’s environment committee has voted to cut the supply of EU carbon allowances, causing the carbon price to climb as high as €9.75, a 32% increase on yesterday’s close. According to the proposals, which were made as amendments to the draft EU energy efficiency directive, the European Commission should amend the law governing the EU Emissions Trading System (ETS) in order to withhold a substantial number of EU allowances (EUAs) from Phase III (2013-20) of the ETS. A clear majority of the committee backed this amendment, according to reports, but another vote on the quantity to be set aside – 1.4 billion – was passed by just one vote. A separate amendment to steepen the rate at which the carbon cap is tightened was warmly welcomed by environmental group WWF. The committee’s proposal to increase the annual reduction factor to 2.25%, from 1.74%, would eliminate more than 8.5 billion EUAs by 2050, it said. Jason Anderson, head of climate and energy at WWF’s European Policy Office, said the move was an “important step towards a key reform of the ETS” that would “guide Europe’s industry towards low-carbon investments”. He said the vote “recognised that the EU ETS is in need of urgent repair. With carbon prices at an historic low, we need to find all possible ways to avoid the risk of locking our society into high-emitting infrastructure for decades to come”. Emmanuel Fages, Paris-based analyst with Société Générale, said “this is still an early stage in the legislative process,” but he noted that “nonetheless, given the price action we are seeing – up 30% – it seems the market is attributing a good probability of success”. The proposals are now scheduled to be voted on by the Parliament’s industry committee – the lead committee on the issue – on 24 January and then would have to be approved by the whole Parliament and the Council of Ministers, representing member states, before they could become law. The EUA contract for December 2012 delivery was trading at €8.83 as this article was published, just after midday GMT. Last Wednesday, the front-December contract settled at €6.45, a record low for the 2008–12 phase. What will the impact on ticket prices be?Assuming airlines fully pass on any extra costs to customers, by 2020 the price of a typical return flight within the EU could rise by between €1.8 and €9, according to European Commission estimates. Long-haul trips will increase by more than that depending on the exact journey length. However ticket price increases are expected to be significantly lower than the extra costs passed on to consumers due to world oil price increases in recent years. Will airlines make money from the scheme by banking permits? Only 10 per cent of emissions permits for aviation will be auctioned, with the rest being allocated. This has led some critics to say that the aviation industry will make windfall profits from the scheme in the same way the steel sector has done over recent years. But an analysis by Ernst & Young disagrees with this hypothesis, saying that airlines operate their business models differently, and so are unlikely to bank permits in the same way. Where will the money from the auctioned permits go? The money from permits auctioned to operators will go to the corresponding member states which are in charge of distribution to that airline. The EU directive states that money raised should be spent on climate change initiatives; however it is not a legal requirement. The UK Treasury, for example, is opposed to ringfencing revenue streams and is unlikely to make an exception for revenue raised from auctioning EUAs to airlines. The industry has consistently argued that if it must be included in the ETS the money raised by exchequers should be recycled to support investment in green aviation R&D. Posted: Tuesday, January 3rd, 2012. Filed in Climate Change News, Recent News.